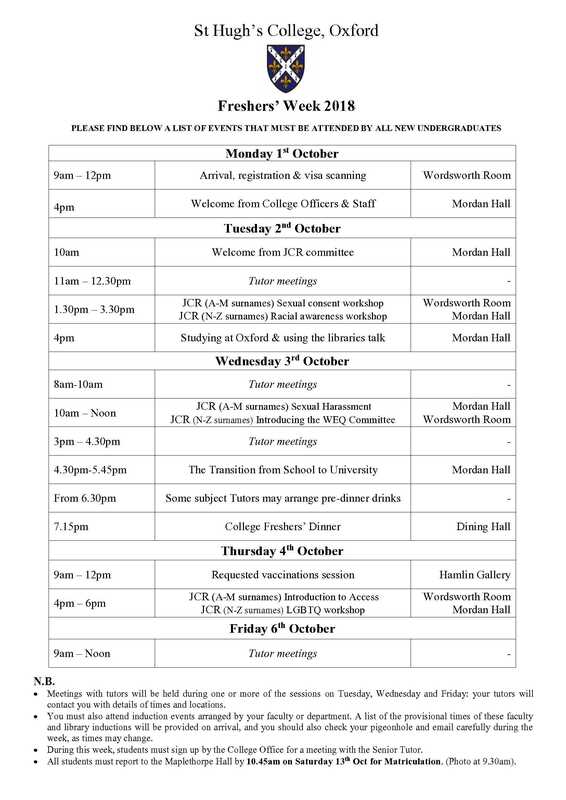 New undergraduates in Oxford have a busy week of events in Freshers’ Week, the Freshers’ Week Timetable can be found below. There will be a mixture of formal events arranged by the College and more informal events organised by the Junior Common Room. Please refer to the JCR’s timetable for JCR events. When you arrive on Monday 1st October, if you are an international student, you must bring your passport and visa/BRP card to be scanned. Please contact the College Office if you anticipate difficulties. All first year undergraduate students must attend the Matriculation Ceremony on Saturday of 1st Week in Michaelmas term in order to be considered members of the University. Students must wear full academic dress, and more information about academic dress can be found on the University website. Are there specific induction events for international students? Please see the information for International and EU students on the left of this page, noting the code ‘OP2018’. When will I meet my tutor? Your tutor will arrange to meet with you, probably in one of the subject session slots above. Do I have to attend all events? You should attend all formal events noted on the Freshers’ Week Timetable; some JCR events are optional. When will my lectures and tutorials start? Teaching usually begins in 1st Week, the week after Freshers’ Week (0th Week), but you will probably be set some work during 0th Week.